Chinese President Hu Jintao said in Beijing Wednesday that cooperation was stronger than competition between China and Britain because the two economies were compatible with each other. 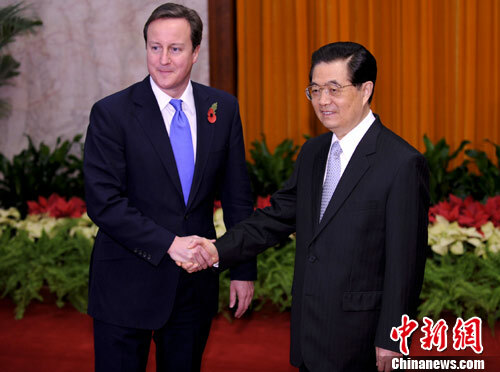 Chinese President Hu Jintao met with British Prime Minister David Cameron in Beijing, November 10, 2010. Hu made the remarks when meeting with visiting British Prime Minister David Cameron. Hu greeted Cameron in the Great Hall of the People in downtown Beijing, and asked the prime minister to convey his sincere greetings to Queen Elizabeth II. Hu noted that Cameron, the youngest British PM in 200 years, and his cabinet "are energetic," and predicted that bilateral relations would see further growth under Cameron's leadership. Saying that China and Britain were important strategic partners, Hu urged the two countries "to make good use of the development opportunities." He told Cameron "new energy, new material, energy-efficiency and environmental protection know-how and high-end manufacture" could be new growth areas for bilateral cooperation. The Hu-Cameron meeting came before the fifth Group of 20 summit, due to be held in Seoul, capital of the Republic of Korea. "We share close stances and many consensuses on anti-protectionism, the advance of the Doha round of global trade talks and the establishment of a new international financial order so it's necessary to strengthen communication and coordination," Hu said. Hu and Cameron had their first meeting at the Group of 20 summit in Toronto, Canada, in June this year, soon after Cameron took office. Cameron leaves China for Seoul later Wednesday. He led the biggest ever delegation to China, including key cabinet ministers such as Chancellor of the Exchequer George Osborne and Secretary of State for Energy and Climate Change Chris Huhne. About 50 UK leading business people accompanied him. Britain highly values its relations with China, said Cameron, adding that Britain places great attention to the "high-level dialogue covering all areas" between the two countries. He suggested the two sides seize opportunities in trade and dual-track investment and expand cooperation in such areas as energy, environment and pharmaceutics. He agreed with Hu to fight against protectionism and push forward the Doha round of talks. Before his visit, Cameron said the China tour was "a vitally important trade mission." While in China, Cameron also witnessed the signing of several commercial deals, including the 1.2-billion-U.S.-dollar deal between China Eastern Airlines and British jet engine-maker Rolls-Royce. Media reported that the British Treasury said earlier that the two sides would sign contracts worth 2.7 billion dollars during Cameron's two-day visit. China-Britain trade reached 357.5 billion dollars in the first nine months, a year-on-year rise of 29.4 percent.